The Jazz Spivs are the perfect act to complete your search for jazz band hire Cheshire. Jazz Spivs are wedding entertainment specialists. For vintage, speakeasy and 1920s themed weddings, there really is no equal. With experience comes expertise and this jazz band performs at venues all over the country and abroad. We bring extra pizzaz to your special day – and everything is done with the utmost professionalism. If you’re planning a themed wedding, Jazz Spivs are the perfect jazz band hire. They are the epitome of authentic roaring twenties jazz. Of course, Jazz Spivs will perform live at your wedding reception. What’s more, they’ll make the event is a real celebration. A packed dancefloor all evening – that’s guaranteed. We are well aware that your wedding day is your day. Therefore, we’re happy to accommodate any special requests you have. We’ll always do our very best to meet your needs exactly. To give you an idea of our repertoire, take a look at our track list. Weddings are the obvious choice, perhaps, but there are many other events calling out for jazz band hire in Cheshire. The reason? Jazz is so versatile! 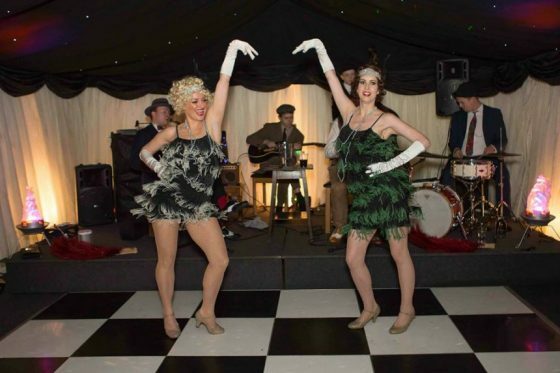 A 1920s theme is very popular for corporate events and parties. The Jazz Spivs always dress smartly. However, if you would like them to perform in 1920s garb to match their authentic 1920s sound, that can be arranged. Similarly, they can take on company colours too. The same is true for product launches. The 1920s was such an iconic decade, it’s no wonder people still want to celebrate it. Buoyed by a wave of television programmes and films set in the decade, Great Gatsby or Peaky Blinders-inspired events are all the rage. Prohibition or speakeasy parties never go out of fashion. Jazz Spivs provide a sizzling soundtrack for them all. All in all, Jazz Spivs are your go-to act when it comes to jazz band hire Cheshire. They are proud of their excellent reputation. The 1920s is an understandably popular theme for a whole host of events. However, the success of any themed events rests squarely with the authenticity it creates. Jazz Spivs guarantee authenticity. This is an act that looks and sounds the part – 100%. A common question asked is how much does jazz band hire in Cheshire cost? For the answer, check out How much does a live jazz band cost? So, whatever the event is that you are planning, get in touch with the Jazz Spivs today.